EghtesadOnline: As Harvey’s winds die down, trouble for Texas may have just begun with forecasts for unprecedented flooding across the heart of U.S. energy production and in Houston, the nation’s fourth-largest city. Harvey smashed ashore as a Category 4 hurricane Friday near Rockport, Texas. One death has been attributed to the storm, which has also halted about one quarter of oil production in the Gulf of Mexico and 5 percent of U.S. refining capacity. 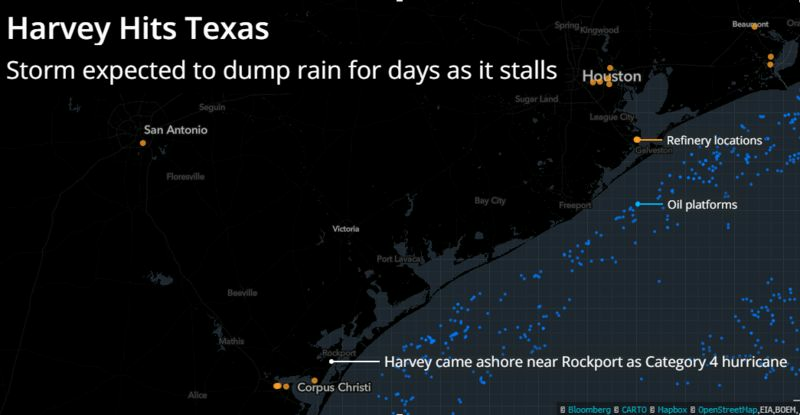 Its second act could be worse as Harvey stalls and promises to dump feet of rain onto Texas for the next few days, Bloomberg reported. Damage from the initial strike won’t tell the whole story, said Chuck Watson, director of research and development, at Enki Holdings LLC in Savannah, Georgia. “If it was a traditional hurricane it would be a $2 billion storm, maybe $3 billion, but that is not what this storm is about,” Watson said. Harvey was the strongest storm to hit the U.S. since 2004. After making landfall, it was downgraded to a tropical storm and came to a near-standstill near the town of Victoria, Texas. Harvey is flooding a region that has a cluster of refineries that process 5 million barrels of oil a day. About 1 million barrels a day of crude and condensate refining capacity in Texas have been shut by companies including Valero Energy Corp., according to company statements, government releases and people familiar with the situation. Its path through the Gulf shuttered 24 percent of oil production, along with the port of Corpus Christi, which ships the largest amount of U.S. crude overseas. In addition to the energy threat, crops and livestock may struggle to cope with rising waters, while airlines have canceled flights at multiple Texas airports. At least 1,121 inbound and outbound flights were canceled Saturday from Texas airports in Houston, Dallas, Corpus Christi, Austin and San Antonio, according FlightAware, a Houston-based airline tracking company. At least another 1,214 were scrubbed for Sunday. At least 226,330 customers were without power across the state, according to a Bloomberg survey of electric utility outage maps as of 9 p.m. local time. The drop in electricity demand could depress natural gas prices. From 15 to 25 inches of rain is forecast across the entire region, with some areas getting as much as 40 inches, the National Hurricane Center said in an advisory issued around 10 p.m. local time. Harvey sent thousands of residents along the coast fleeing and caused Governor Greg Abbott to declare an emergency. President Donald Trump approved a major disaster declaration, making federal assistance available to supplement state and local recovery efforts. The U.S. Environmental Protection Agency waived certain fuel requirements for gasoline and diesel supplies in Texas, including the Dallas-Fort Worth area, to allay concerns of fuel shortages. If the storm does significant damage to the refineries in the region, or causes the Colonial pipeline to go offline, the effects could ripple to other parts of the country that rely heavily on the Gulf Coast for fuel supplies. Gasoline futures settled at a three-week high Friday as the storm approached.